London, Sotheby's, July 24, 1924, lot 153; Maggs Brothers Ltd., London; C. Peter Jones; his sale, London, Sotheby's, July 8, 1957, lot 61; purchased there by Maggs Brothers Ltd. for William S. Glazier, New York; deposited in the Pierpont Morgan Library by the trustees of the William S. Glazier Collection in 1963. Flemish manuscript single leaf, illuminated in Bruges, ca. 1510. This leaf is part of a set of 11 full-page miniatures, with a common format and script, that are held in various public and private collections, including: Berlin, Kupferstichkabinett, KdZ 641; Berlin, Kupferstichkabinett, KdZ 667; London, Sotheby's 11.12.1972, lots 10, 11, 12; Cambridge, Fitzwilliam Museum, Marlay Cutt. Sp. 2-5; and a miniature formerly in Brussels, Cardon Collection (see Brinkman). 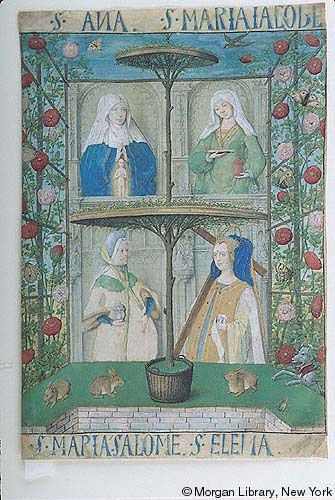 Decoration: 1 full-page miniature depicting four half-length saint's figures against architectural frames in a landscape: Saints Anne; Mary, the mother of James; Mary Salome; and Helena. Artist: an anonymous artist and the Master of the Lübeck Bible. According to Arnould and Massing, these miniatures were "aimed at a Spanish public. This is indicated by the language of the inscriptions above and below the images and by the choice of saints. [...] Trading links between Flanders and Spain were very strong during this period and the manuscript could well have been commissioned for or by a Spaniard living in the Netherlands." --Cf. Splendors of Flanders, p. 86.